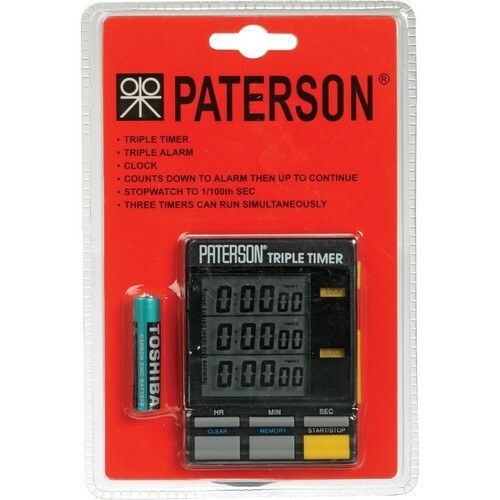 Paterson's Triple Darkroom Timer functions include countdown/count up timing, 24 hour clock, and stopwatch, accurate to .01 second. Three independently controlled timing fields, ideal for timing print or film developing, hot mounting or laminating. Large LCD readout, three distinct audible signals. Magnetic back for mounting convenience. Operates on "AAA" battery (included). Box Dimensions (LxWxH) 8.0 x 5.0 x 0.75"